'So, erm, do you think this is it?’ I’m hoping for some reassurance, but photographer Dean Smith looks equally bemused. ‘Er, maybe,’ he replies. We’re chugging into Limburg, north-west of Frankfurt, in a hired Mégane Scenic on what feels like a wild goose chase. Some geese are worth chasing, though, and a unique prototype of a proposed Lancia Delta Integrale Evo 3 is definitely one of them. Thankfully, it is. The ‘Viola’ prototype – so named after the colour of its paintwork – sits under a layer of dust, cowering like a lamb neglected by its mother. Perhaps it’s fitting that this car looks so forlorn. 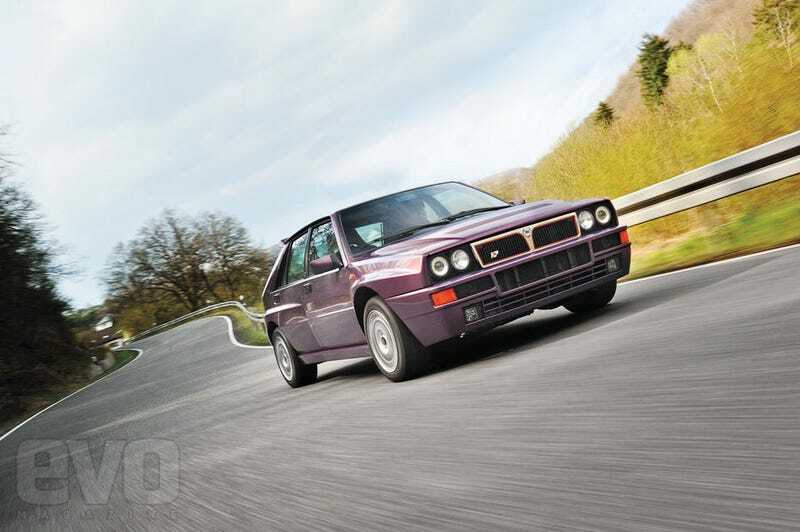 It was born out of desperation at the end of the Integrale’s life, a project entirely developed by Maggiora, the coachbuilder that manufactured the Evo 2, but quickly rejected by Lancia. The factory had officially pulled out of the World Rally Championship after the 1991 season (although Lancia won another constructors’ title in 1992 thanks to cars run by Jolly Club and Martini Racing) and so by the spring of 1994, when Maggiora presented the car to Lancia in Turin, the Integrale must have felt like history to them already. Bruno Maggiora, of course, couldn’t have felt more differently. He created this concept to show how a faster and more agile Integrale – an Evo 3 – could be, hoping to revive sales and Lancia’s commitment to its iconic four-wheel-drive machine. Sadly, it wasn’t to be, but today we’re going to get a taste of what might have been. A battery booster brings the Viola instantly to life, and it grows in stature with every rotation of its wheels as it’s inched out into the wild. It’s a flat, grey morning without a hint of sun to bring that Lamborghini-sourced colour to life, but the Integrale looks so right. They always do. It’s not Pebble Beach-immaculate underneath the grime, but the closer you get, the better it looks. The interior is as wonderfully awful as any other Integrale’s, but the beige rear seats have never been sat in and only a few tiny creases on the thick bolsters of Alcantara that frame the driver’s seat age it a single day. Bruno Maggiora might have used the Viola regularly for a time, but he obviously treated it like his baby for the 7000 miles or so that they covered together. I can’t help but look in the boot at the pristine Michelin space-saver tyre with sharply defined little Bibendums etched into the tread. I’ve never poked around a genuine, unrestored ‘time-warp’ car before, so it seems right to breathe in every little detail. It doesn’t look very different to an Evo 2, does it? In 1994 a set of 17in MiM TecnoMagnesio wheels would have been the only differentiator, but these have disappeared with the mists of time. But underneath the skin, this car is exactly how Maggiora wanted the Evo 3 to be. The 1995cc four-cylinder engine is largely unchanged, but thanks to a new injection system, a more sophisticated IAW P8 ECU and an increase in boost for the Garrett T3 turbocharger to more than 1bar, power is up from 215bhp to 237bhp at 6000rpm, with 236lb ft of torque between 2500 and 6000rpm. The boost in performance is relatively small, but in combination with a faster-acting GKN limited-slip diff for the front axle, a new clutch for the centre diff, a short-shift gearchange and revised springs and dampers, the overall effect is said to be transformative. But then the owner of this car, Werner Blaettel, and the bloke trying to sell it on his behalf for £85,000, Nick Johnson of the Nick Johnson Motor Company, would say that. Fortunately, Blaettel is wholly relaxed about us driving this unique Integrale, and although we’re not about to destroy its very hard looking and heaven-knows-how-old 205/50 ZR15 Pirelli P700s, he knows a decent road nearby where we can feel the full power of the engine and, perhaps, get a sense of whether this prototype really moved the game on. Wow. The instrument binnacle literally looks like it’s been made out of a shoebox that’s been tightly wrapped in black, shiny plastic and plonked on top of an equally shiny plastic shelf. But I’m a sucker for the yellow graphics of the dials. The speedo is to the left with 0kph at the 9 o’clock position, sweeping around to 240kph (149mph) at 6 o’clock. On the right, the rev counter runs from 0rpm at 3 o’clock to a big red 9 at the 12 o’clock position. Dead ahead, and right where your eyes naturally fall, is a boost gauge reading up to 1.2bar. Attached to the horizontal shoebox is a vertical one that drops down to the transmission tunnel, but it’s trimmed in carbonfibre. Horacio Pagani might not want to hang this hunk of smudgy-weaved material on his wall, but it was 1994 and Maggiora must have had a tiny budget to make the proposed Evo 3 feel a bit special. I rather like it and can imagine a proud employee gluing it into position and then standing back to admire his bit of carbon jewellery. The beige velour seats feel fantastic: soft, warm and grippy. And the thick-rimmed Momo Corse steering wheel feels just right despite being canted back. The Viola feels every one of its 18 years at a standstill and even when you fire up that gruff four-cylinder engine and blip the throttle, feeling its sticky inertia that’s crying out for a turbo spinning at 100,000rpm, it still feels pretty vintage. The slender pillars only add to that impression, but as soon as you feel that tight, mechanical short-shift ’box and the vicious paddle clutch, you stop trying to contextualise the experience and just get involved. One thing’s for sure: it feels different. Of course, it’s still an Integrale and very obviously so, but there’s a new sense of lightness and response. The turbo spools up fast and smooth, zinging the needle around to 6500rpm in a heartbeat. You feel a little torque effect through the steering, but even museum-spec tyres provide assured traction. What really impresses is the steering feel and the way this tiny car darts into corners and fires out of them. To me the Integrale has always been a tricky car to really hook up, as you tend to run into understeer and then feel a noticeable lag before the four-wheel drive works out how to neutralise the balance. But the Viola resists that turn-in understeer phase and you really appreciate that the torque split is rear-biased as the turbo spins up again. This car shares the 47/53 split of the Evo 2, but you’d swear there was more power channelling rearwards – perhaps the uprated front diff allows the inherent balance to really shine. It’s easy to get swept along by this prototype because it gives so much feedback – the steering wriggling and writhing around under power, weight ebbing and flowing with the road and your progress through any corner, and the engine providing really accurate response all the way from 3500 to 6000rpm. In terms of outright pace, it’s quick rather than scintillating. Even if it punched as hard as, say, a Mégane 265 Cup (it doesn’t), it simply wouldn’t see which way the modern hot hatch went. It just doesn’t have the grip, nor the crazy turn-in response of the best modern hot hatches. It’s more relaxed and more fluid over lumps and humps, though, and you surf along in a series of strong waves of torque. I guess it feels more honest but, strangely, less focused. Time really does wait for no man, or machine for that matter, as Maggiora discovered in 1994. Perhaps it was the Integrale’s time. A new four-wheel-drive hero had arrived on the rally scene in 1993 and its road-car cousin was blowing the minds of media and customers alike. It didn’t have the same Italian cool, but its flat-four burr was to become as iconic as the Lancia’s wheelarches or the five-cylinder warble of the Quattro. It was called the Impreza and it was cheap and brilliant, and in truth, a mildly tweaked Integrale wasn’t going to be able to run with it for long. Even the relatively tame UK-spec Impreza Turbo with 208bhp would leap to 60mph in the mid-fives, and Japanese versions had 250bhp, soon rising to 280bhp. A year after Maggiora presented the Viola in Turin, Colin McRae won the WRC in the Impreza and its legend was assured. The Delta Integrale might have grown old disgracefully, getting stronger with every passing year, but Lancia was right to close the book on this amazing car in 1994. So the Viola, a vision of the Evo 3 realised without Lancia’s input but with total devotion, represents a classic case of unrequited love. Maggiora went on to build the portly Kappa Coupe for Lancia, but the Viola stood proudly at the end of the production line, and at the factory’s edges, boxes were piled high with Integrale components. Bruno Maggiora couldn’t let it go. I hope he took satisfaction from creating a faster, more exciting Integrale. It might not have ever officially been the Evoluzione 3, but this car deserves the badge.